J. Jürjens: On a problem of Gabriel and Ulmer. In: Journal of Pure and Applied Algebra, vol. 158, pp. 183-196, 2001. T.-M. Hesse R. Heinrich: The CoCoME Platform: A Research Note on Empirical Studies in Information System Evolution. In: International Journal of Software Engineering and Knowledge Engineering (IJSEKE), 2015. J. Bürger, J. Jürjens, S. Wenzel: Restoring Security of Evolving Software Models using Graph-Transformation. In: International Journal on Software Tools for Technology Transfer (STTT), vol. 17, no. 3, pp. 267-289, 2015. F. Dupressoir, A. D. Gordon, J. Jürjens, D. Naumann: Guiding a General-Purpose C Verifier to Prove Cryptographic Protocols. In: Journal of Computer Security, vol. 22, no. 5, pp. 823-866, 2014. Special issue with best papers from the 24th IEEE Computer Security Foundations Symposium (CSF). S. Wenzel, D. Warzecha, J. Jürjens, M. Ochoa: UMLchange - Specifying Model Changes to Support Security Verification of Potential Evolution. In: Journal of Computer Standards & Interfaces, vol. 36, pp. 776-791, 2014. Special Issue on Security in Information Systems. M. Felderer, B. Katt, P. Kalb, J. Jürjens, M. Ochoa, F. Paci, L. M. S. Tran, T. T. Tun, K. Yskout, R. Scandariato, F. Piessens, D. Vanoverberghe, E. Fourneret, M. Gander, B. Solhaug, R. Breu: Evolution of Security Engineering Artifacts: A State of the Art Survey. In: International Journal of Secure Software Engineering (IJSSE), vol. 5, no. 4, pp. 48-98, 2014. S. Taubenberger, J. Jürjens, Y. Yu, B. Nuseibeh: Resolving Vulnerability Identification Errors using Security Requirements on Business Process Models. In: Journal on Information Management and Computer Security (IMCS), vol. 21, no. 3, pp. 202-223, 2013. K. Schneider, E. Knauss, S. Houmb, S. Islam, J. Jürjens: Enhancing Security Requirements Engineering by Organisational Learning. In: Requirements Engineering Journal (REJ), vol. 17, no. 1, pp. 35-56, 2012. S. Islam, H. Mouratidis, J. Jürjens: A Framework to Support Alignment of Secure Software Engineering with Legal Regulations. In: Journal of Software and Systems Modeling (SoSyM), Springer-Verlag, vol. 10, no. 3, pp. 369-394, 2011. A. Bauer, J. Jürjens, Y. Yu: Run-Time Security Traceability for Evolving Systems. In: The Computer Journal, vol. 54, no. 1, pp. 58-87, 2011. H. Mouratidis, J. Jürjens: From Goal-Driven Security Requirements Engineering to Secure Design. In: International Journal of Intelligent Systems (IJIS) (Wiley Interscience), International Journal of Intelligent Systems, vol. 25, no. 8, pp. 813-840, 2010. Special issue on "Goal-Driven Requirements Engineering". S. H. Houmb, S. Islam, E. Knauss, J. Jürjens, K. Schneider: Eliciting Security Requirements and Tracing them to Design: An Integration of Common Criteria, Heuristics, and UMLsec. In: Requirements Engineering Journal (REJ), Springer-Verlag, vol. 15, no. 1, pp. 63-93, 2010. Special issue on Security Requirements Engineering. A. Bauer, J. Jürjens: Runtime Verification of Cryptographic Protocols. In: Computers and Security, Computers and Security, vol. 29, no. 3, pp. 315-330, 2010. J. Jürjens: A domain-specific language for cryptographic protocols based on streams. In: Journal of Logic and Algebraic Programming, vol. 78, no. 2, pp. 54-73, 2009. M. Woodside, D. C. Petriu, D. B. Petriu, J. Xu, T. Israr, G. Georg, R. France, J. M. Bieman, S. H. Houmb, Jan Jürjens: Performance Analysis of Security Aspects by Weaving Scenarios from UML Models. In: Journal of Systems and Software, vol. 82, no. 1, pp. 56-74, 2009. J. Jürjens, R. Rumm: Model-based Security Analysis of the German Health Card Architecture. In: Methods of Information in Medicine, vol. 47, no. 5, pp. 409-416, 2008. Special section on Model-based Development of Trustworthy Health Information Systems. 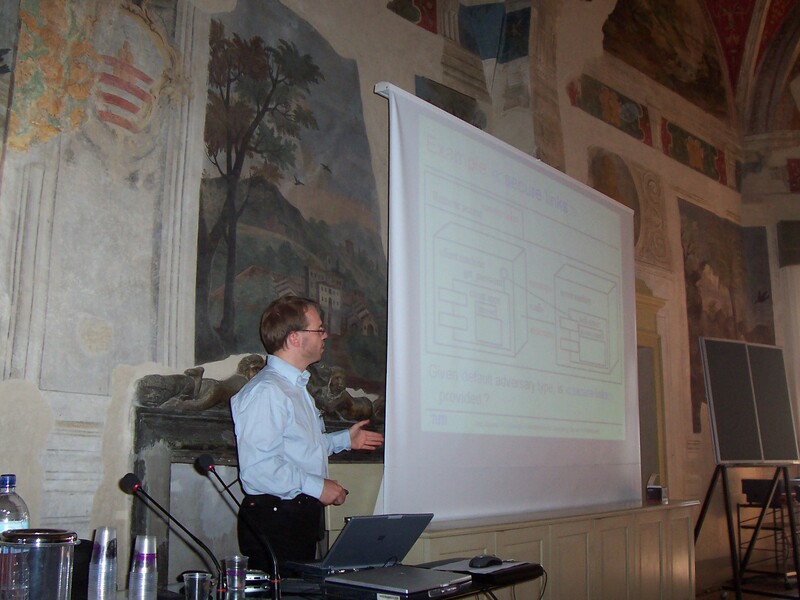 J. Jürjens, P. Shabalin: Tools for Secure Systems Development with UML. In: International Journal on Software Tools for Technology Transfer (STTT), vol. 9, no. 5--6, pp. 527-544, 2007. Invited submission to the special issue for FASE 2004/05. D. Zaitsev, J. Jürjens: Programming in Sleptsov Net Language for Systems Control. In: Advances in Mechanical Engineering, 2016. M. S. Sadi, D. G. Myers, C. O. Sanchez, J. Jürjens: Component criticality analysis to minimize soft errors risk. In: International Journal of Computer Systems Science & Engineering, vol. 25, no. 5, pp. 23-37, 2010. J. Jürjens: Componentware for Critical Systems. In: Journal of Object Technology, vol. 3, no. 4, pp. 47-50, 2004. J. Jürjens: Developing Security-Critical Applications with UMLsec - A Short Walk-Through. In: Novatica, vol. 168, 2004. J. Jürjens: Foundations for Designing Secure Architectures. In: First International Workshop on Views On Designing Complex Architectures (VODCA 2004), Bertinoro, 2004. Invited talk. J. Jürjens: Games in the Semantics of Programming Languages. In: Journal Synthese, vol. 133, no. 1-2, pp. 131-158, 2002. J. Jürjens: Automated Security Verification for Crypto Protocol Implementations: Verifying the Jessie Project. In: Electr. Notes Theor. Comput. Sci., vol. 250, no. 1, pp. 123-136, 2009. J. Jürjens: Model-based Security Testing using UMLsec. In: Electronic Notes in Theoretical Computer Science, vol. 220, no. 1, pp. 93-104, 2008. J. Jürjens, Lidiya Buda: Berechtigungsvergabe in SAP Systemen und ihre automatische Überprüfung. In: Datenschutz und Datensicherheit, 2004. J. Jürjens, Eduardo Fernandez: Secure Database Development. In: Springer pp. TBD Encyclopedia of Database Systems, 2015. Invited chapter, to be published. S. Höhn, J. Jürjens, L. Lowis, R. Accorsi: Identification of Vulnerabilities in Web Services using Model-based Security. In: C. Gutierrez, E. Fernandez-Medina, M. Piattini: (editors): IGI Global Web Services Security Development and Architecture: Theoretical and Practical Issues, 2010. Print ISBN-13: 978-1-60566-950-2. J. Jürjens: Security and Dependability Engineering. In: Springer Lecture Notes in Computer Science pp. 21-36 Security and dependability for Ambient Intelligence, 2009. Invited chapter. J. Jürjens, Eduardo Fernandez: Secure Database Development. In: Ling Liu, M. Tamer (editors): Springer pp. 2528-2534 Encyclopedia of Database Systems, 2009. Invited chapter, ISBN 978-0-387-35544-3. S. H. Houmb, G. Georg, J. Jürjens, R. B. France: An Integrated Security Verification and Security Solution Design Trade-off Analysis Approach. In: H. Mouratidis (editors): Idea Group pp. 190-219 Integrating Security and Software Engineering: Advances and Future Vision, 2006. Invited chapter.